This post is sponsored in partnership with Paramount Pictures. As always, all opinions are my own. When my daughter first got interested in acting, she learned all about the Shakespeare classics. One of her favorite plays was Romeo and Juliet and loves the movie Gnomeo & Juliet. It is now one of our favorite movies that we watch together as a family. A sequel to Gnomeo & Juliet has been announced, and we can't wait! Sherlock Gnomes is sure to be another family favorite, and it's in theaters March 23rd. 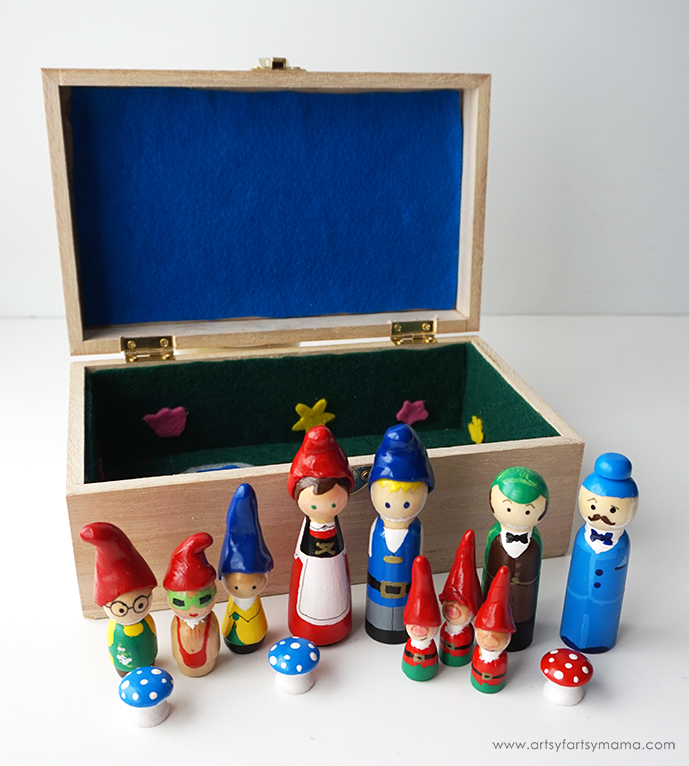 To celebrate our excitement for the movie, I wanted to make some handmade wooden peg dolls inspired by the Sherlock Gnomes characters. While it can take some time and effort, peg dolls are one of my favorite things to make. When I see how my daughter loves playing with every set I've made over the years, it makes every moment of work worth it. After a string of garden gnome disappearances in London, Gnomeo & Juliet look to legendary detective Sherlock Gnomes to solve the case of their missing friends and family. This action-packed sequel to Gnomeo & Juliet features the voices of returning cast James McAvoy, Emily Blunt, Michael Caine, Maggie Smith, Stephen Merchant and Ozzy Osbourne, plus Johnny Depp as Sherlock Gnomes, Chiwetel Ejiofor as Watson, and Mary J. Blige as Irene. Have some images of the characters you want to make on hand to refer to. Since the dolls are so small, I simplify the characters by taking out the smaller details (nose, mouth, etc), but keep the main details (clothing, hair color, etc). 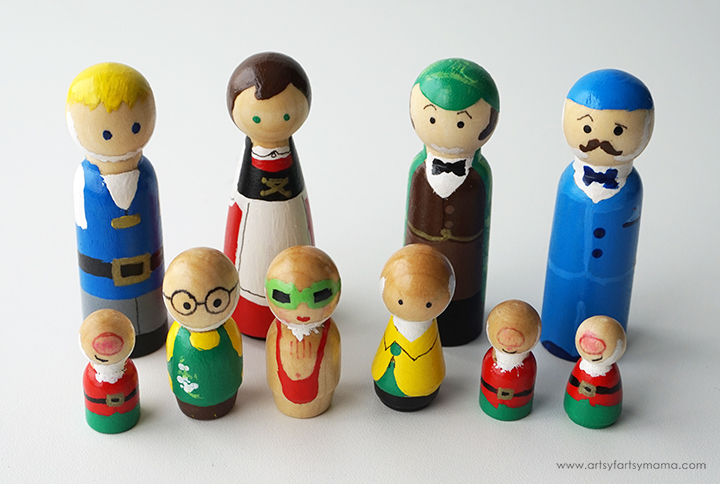 Use a sharp pencil (I prefer a mechanical pencil) and lightly draw the simplified characters on the wooden peg dolls. 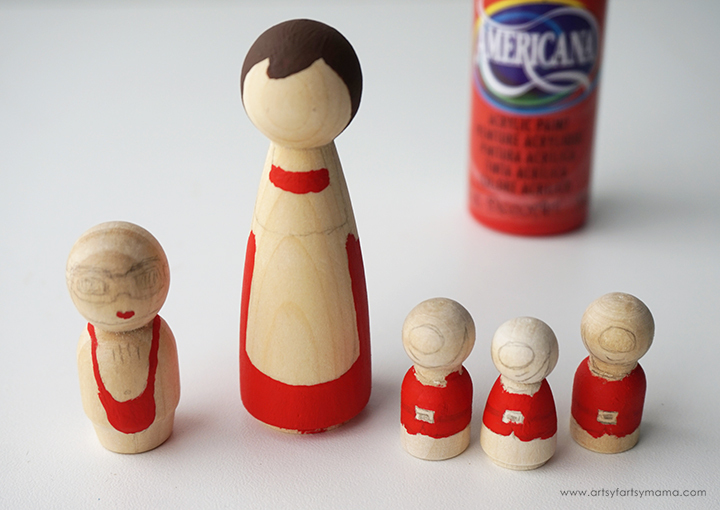 After everything has been drawn onto the peg dolls, the next step is to paint them. 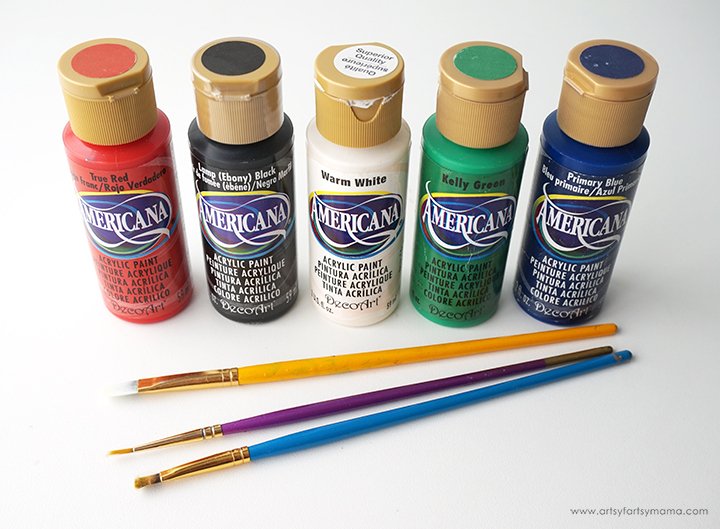 When it comes to paint, I recommend using Americana acrylic paints. Good quality acrylic paints like these will have brighter colors, and you'll only need 1 or 2 coats, which matters when you're working on a project like this. 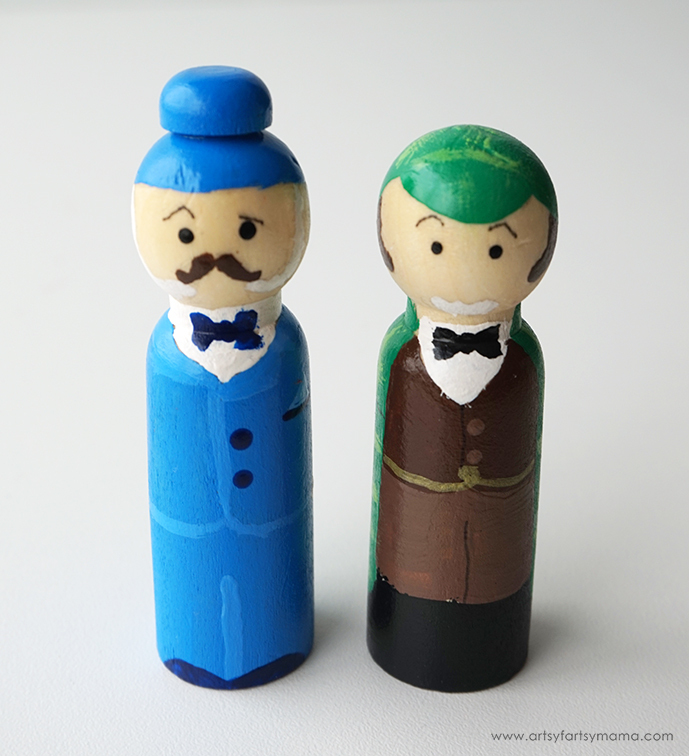 You'll also need a few small paint brushes in different sizes and styles to paint details on the peg dolls. 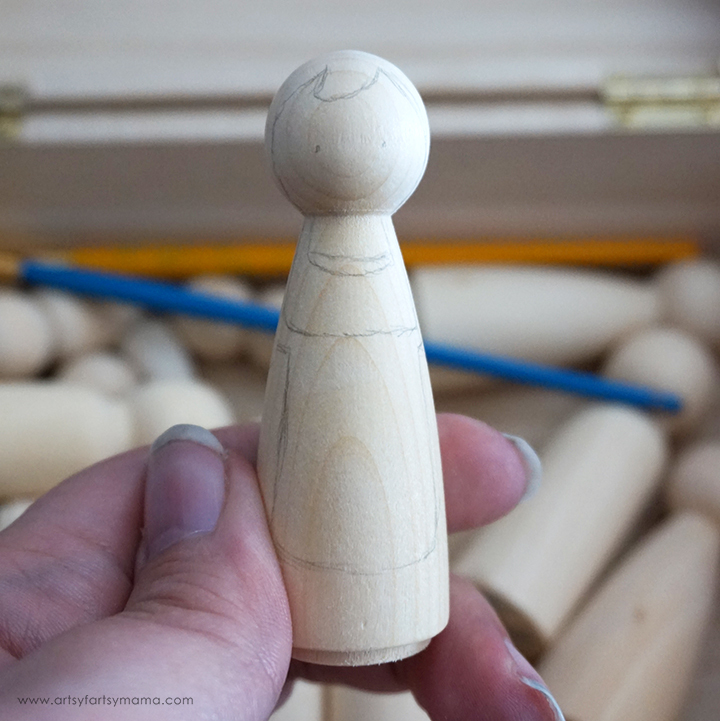 Getting started is the hardest part of making peg dolls. To make it a little easier, I choose one color and paint all of the parts on different dolls. This will also save you on time since you won't need to wash your brushes in between and get the paint out again later! * If the color seems a little dull or you can see the wood grain through it, add another coat. Just make sure that the first coat of paint is dry before you add another. * For the eyes, dip the non-brush end of a small brush into some paint and dab once or twice on a piece of scrap paper. Then carefully dab the brush on the eye pencil marks on the peg doll. * You can use a thin Sharpie marker to add on thin details that a brush wouldn't be able to do (glasses, eyebrows, clothing details). 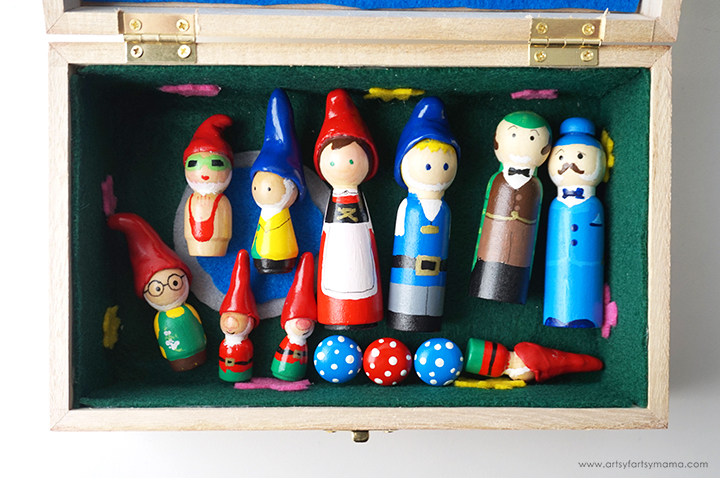 * After you're done painting, use an eraser over the peg dolls to remove any pencil left behind. After all of the dolls have been painted, spray a coat of clear spray paint over the peg dolls to give them a glossy finish and to protect the paint. I painted a few coats - but make sure each coat is completely dry before adding another. While going through my stash, I found some small wooden knobs. I painted the tops red and blue, the bottoms white and added spots to make them look like mushrooms. 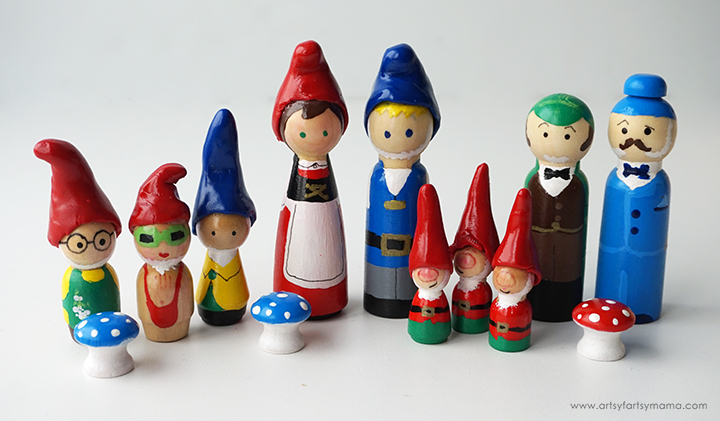 Gnomes and mushrooms are perfect together! Be sure to paint a coat or two of glossy spray paint over the mushrooms as well. In the movie, Watson wears a bowler hat. I painted a small wooden cap to match his hat brim and suit. I finished it off with spray paint, then glued it to the top of his head with a strong craft glue. 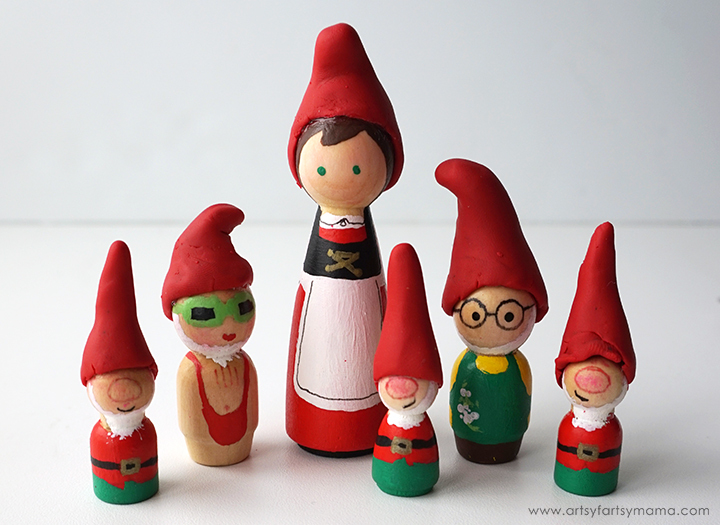 I used a polymer clay that was the perfect red color to match the gnomes. After warming a small ball of clay in my hands, I was able to mold the clay to the shape I wanted and they fit the gnomes perfectly. This is the success!! A thing to know about polymer clay is that it has to be baked to permanently set the shape. 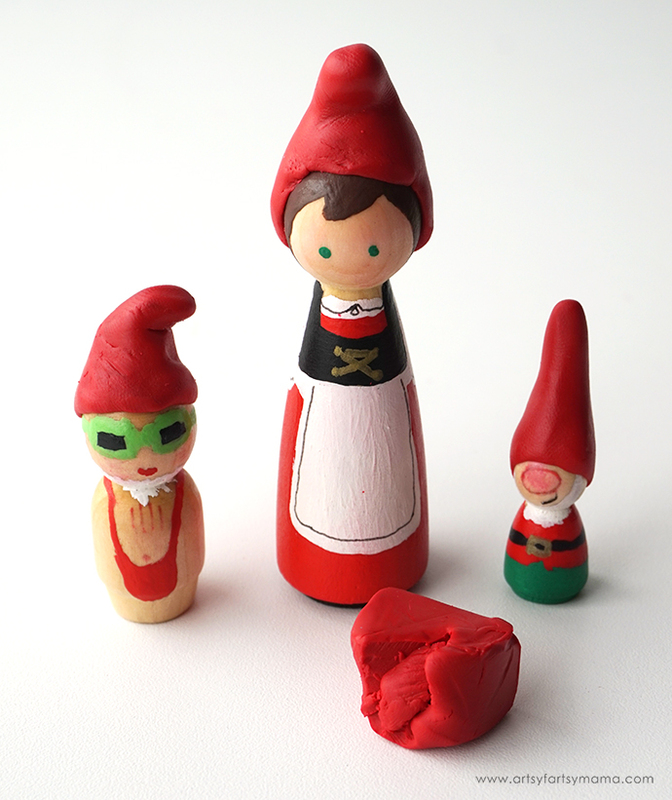 I thought that since the peg dolls had a glossy finish, that the clay would come right off. Not so much. I carefully used a fingernail to loosen the hats around the heads and I completely ruined one of them. I remade the hat and put the peg dolls in the freezer for about 30 minutes. This stiffened the clay and made it a little easier to work with, but they put up a fight. I was finally able to remove the hats after using a fingernail and slowly working them off. I baked them according to package directions, and everything turned out okay in the end. What I would have done different is tried an air dry clay instead. That way, I could have made the hats and let the clay set on the peg dolls. Then you can just paint them and be done! I'll try it next time and keep you updated. After being baked, I let the clay hats cool completely. I added a drop of strong craft glue to the inside of the hats and attached them to each of the peg dolls. I repeated the same process for the characters with blue hats. After the glue dried, I sprayed one last coat of clear spray paint to the hats to give them a glossy finish. The final step is to line up all the peg dolls and admire your work. They make me smile every time I look at them! 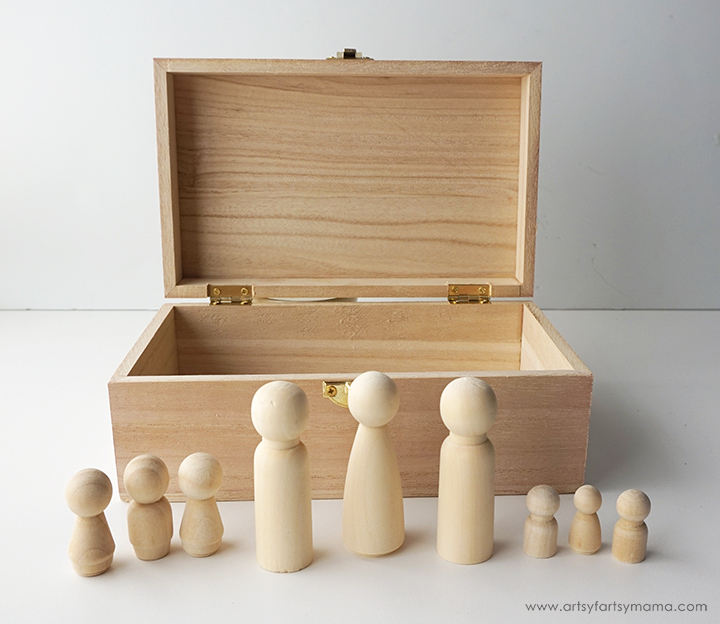 The wooden box will serve a few purposes - it's a great way to keep your peg dolls in one place and stay in great condition. It's also going to be a fun play space for the peg dolls! 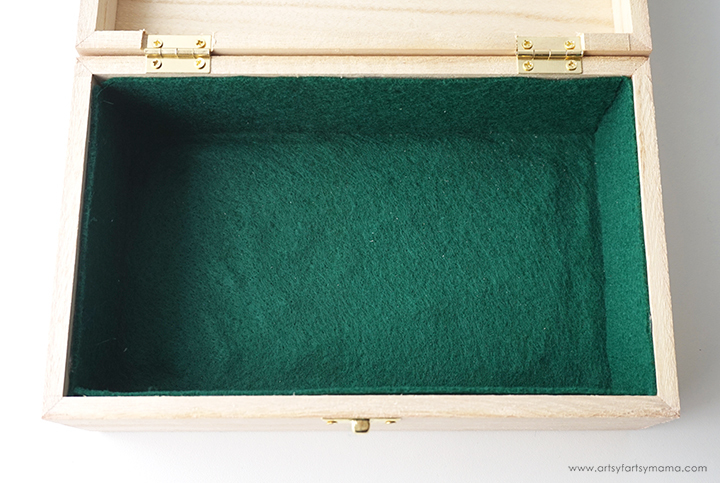 Measure the inside of the box and cut a piece of green felt to fit. Use a glue gun to attach the felt to the bottom. Cut more green pieces of felt to cover the other four sides of the box and attach them with glue. I wanted to make the box look like the gnome garden, so I cut out some little flowers and a cute pond out of felt. 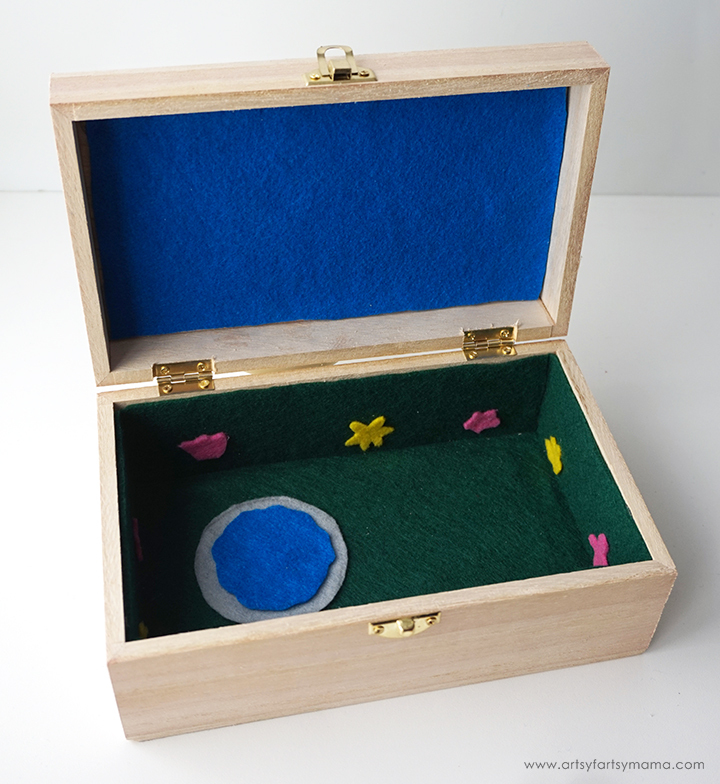 I also cut a rectangle of blue felt to add to the top of the box for the sky. Get creative and add as much or as little as you want! You can also paint the outside of the box to look however you want. My daughter wanted to keep the wood look, so we just painted a thin coat of sealant on the outside to keep it looking nice. Now that the box is complete, it's time to play! Take the gnomes in and out of the box to re-enact scenes from the movie - like this one from the trailer where one of the goons gets stepped on in the garden! 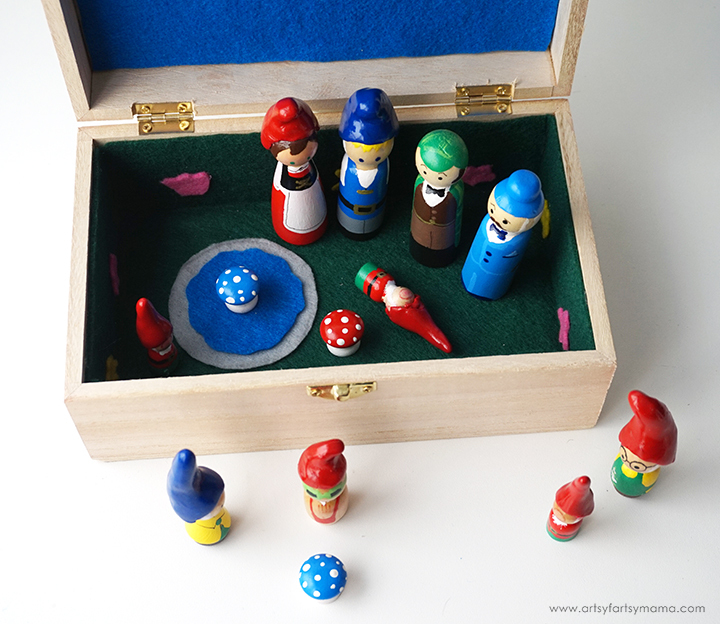 After the kids are done playing, lay all of the peg dolls inside the box. The felt will keep them from getting scratched up, and you can easily find all of the dolls again the next time you want to play. This project has made us even more excited to see Sherlock Gnomes on March 23rd. Until then, we are going to be having a ton of adventures of our own, and probably re-enacting some of the scenes from Gnomeo & Juliet! For all of the Sherlock Gnomes news and fun, visit the Official Website, Like on Facebook, and follow on Twitter and Instagram. 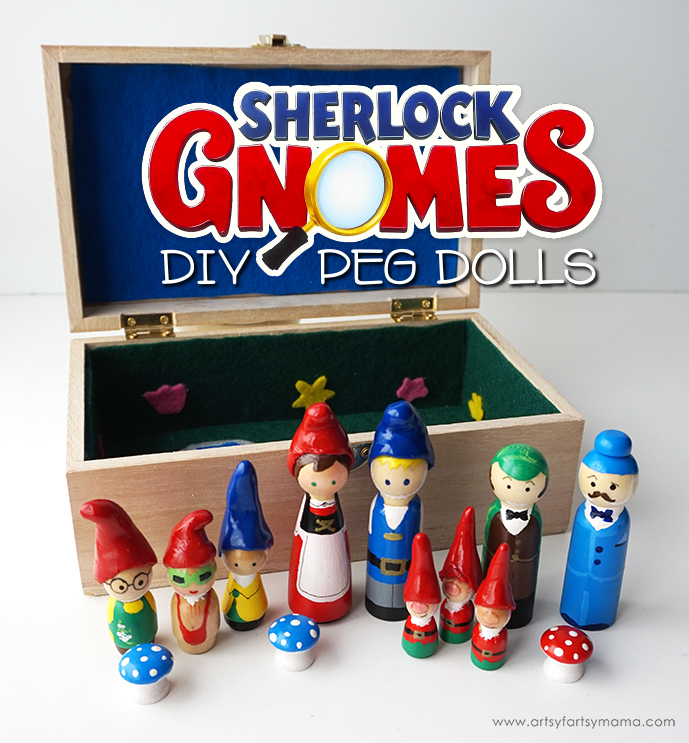 You can also share and follow along with #SherlockGnomes! Who is your favorite Sherlock Gnomes character? Sooooo adorable...I want a set:) Haven't heard of this movie, but it looks like a great one for littles. This is such an awesome craft and it would be great as a little Easter surprise! Oh my goodness, these are adorable! Now I really want to make some Harry Potter peg dolls!! personally gnomes have always creeped me out a bit. This is a really cute craft for people with little kids that loved the movie though! Oh my gosh....how adorable are those!!! I so want to try doing this!!! What a great activity for kiddos! Mine would love all this. What a cute idea!! Need to go see this movie! These dolls are so very cute! My kids can not wait to see this movie. Nice job on those gnomes. They're super cute!